SanDisk has begun offering notebook manufacturers a 1.8in, 32GB Flash-based solid-state drive, the company announced today. It pitched the part as an energy efficient alternative to traditional hard drives for machines that will run Windows Vista. It's faster too, SanDisk said. The SanDisk Ultra ATA 5000 SSD will boot Microsoft's new operating system in 35s - 20s faster than a HDD, the company claimed, citing in-house test figures. It said the drive has a mean time between failures (MTBF) of 2m hours. The drive can shift data at a sustained rate of 62MBps and is more than 100 times faster than HDDs for random 512B reads, the company said. 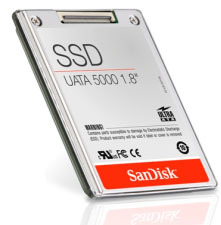 The SSD consumes up to 0.4W of power, compared to 1W for a hard drive, SanDisk added. 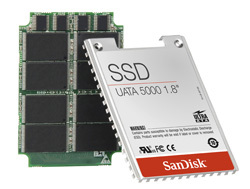 The SSD approach contrasts with the one adopted by members of the new Hybrid Storage Alliance (HSA), who want to incorporate Flash caches into standard hard drives. Of course, the one number SanDisk didn't provide for the SSD was its price, despite going at lengths to explain how NAND Flash is so much cheaper these days, allowing SSD technology to reach broader applications than military and aerospace ones. But it's telling that SanDisk is initially pitching the product at enterprises.